The month of May continues to make my head spin. I don't know how people travel for business on a regular basis, spending a few days in one city and then another. After only two trips this month, I am completely turned around and not sure which way is up. You know the feeling, when you've been blindfolded and spun around just before swatting a pinata...that feeling. Then again, it seems that kids don't hit pinatas anymore. Instead of each child hitting it with a stick, there are several ribbons attached to the "escape hatch." Each child gets to pull, or maybe they all pull at the same time. So kids today might not learn what that particular feeling of dizziness is like (dizziness in general, sure...). But anyway. That's how I've been feeling all month. And so...I completely forgot to mention here that I was doing a guest post yesterday at Romancing the Book. D'oh! It was about seduction and music, specifically the seductiveness of the cello. That's right, I said cello. If you don't think it's a seductive instrument, go read the post and give me a chance to convince you. At least I remembered to mention the RtB guest spot on Twitter and FB like a good little newbie author. And the good news is that the guest spot includes a giveaway--an ebook copy of NEVER TOO LATE--and the giveaway runs for 5 days! So I'm a little late in announcing it, but it's still not over! You still have time to go enter! First, THANK YOU all so much for participating in the NEVER TOO LATE prize pack giveaway and for celebrating the release of my debut historical romance with me! It's been a great week, and it was especially wonderful to share it with so many lovely and supportive people! Congratulations, Kathie! I will contact you via email with details! And again, thanks so much to everyone who helped make an unbelievable week even more special! 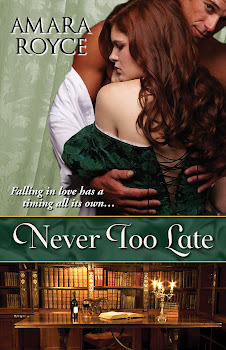 It is my very great pleasure to announce that today is the release day of my debut historical romance, NEVER TOO LATE, by eKensington! It's hard to believe release day is finally here! So...I'm commemorating the big day in multiple places! Thanks for visiting and sharing this wonderful day with me! I'm also doing an all-day NEVER TOO LATE Release Day event on Facebook! (Okay, so "all-day" means 8 am to 8 pm ET in my world.) Join the FB event for random tidbits and trivia and Q&A. And watch for random surprise giveaways during the FB too! I'm giving away a NEVER TOO LATE prize pack that includes a free copy of Never Too Late (e-book), a $25 Amazon gift card, a cameo pendant, and some NTL swag! Through this Rafflecopter giveaway, people are welcome to enter multiple times through multiple venues (including Facebook and Twitter) from now until May 9th! See the entry app below to see the different ways to enter! !